‘Fine Fabrics; Fabulous Fashions’: The story of Moygashel Linen Mills. Many vintage collectors have a soft spot in their hearts for Moygashel Mills linen fabrics, produced in the small Northern-Irish village of Moygashel, County Tyrone yet there appears to be little in-depth study of its history and development. Many people think that Moygashel is pronounced ‘Moy-ga-shell’, but for locals, it is pronounced ‘Moy-gash-ill’ as it derives from an ancient Irish word, meaning field of the stone fort. It began life as a manufacturer of fine linen goods for the aristocracy in the 1780’s. By the mid-20th century, Moygashel linens were a well-known and high-quality brand exported across the world for use in home furnishings and dressmaking. The range and quality of the work is illustrated in the company’s promotional material, aimed firmly at an extensive and well-established global market. Under closer inspection this literature can reveal much about the social history of textiles and dressmaking, industrial archaeology, global trade and colonialism. Local historian Mona Wylie researched and produced Moygashel Mills: A Brief History, which was published in Dúiche Néill, the Journal of The O Neill Country Historical Society in 2007. She also identified the existence of an archive assembled by locals who worked in the factory which includes a collection of fabric swatches from the 1940s to the 1970s, account books, patents, trade pamphlets and correspondence with designers such as Ursula Hulme MBE. This archive is an untapped resource for Irish academics and dress historians, as no monograph or museum exhibit has yet to detail the extensive material and social history of Moygashel Mills in any depth. The archive includes fabric swatches alongside photographs of the fabrics made up into dresses and furnishing as shown here. 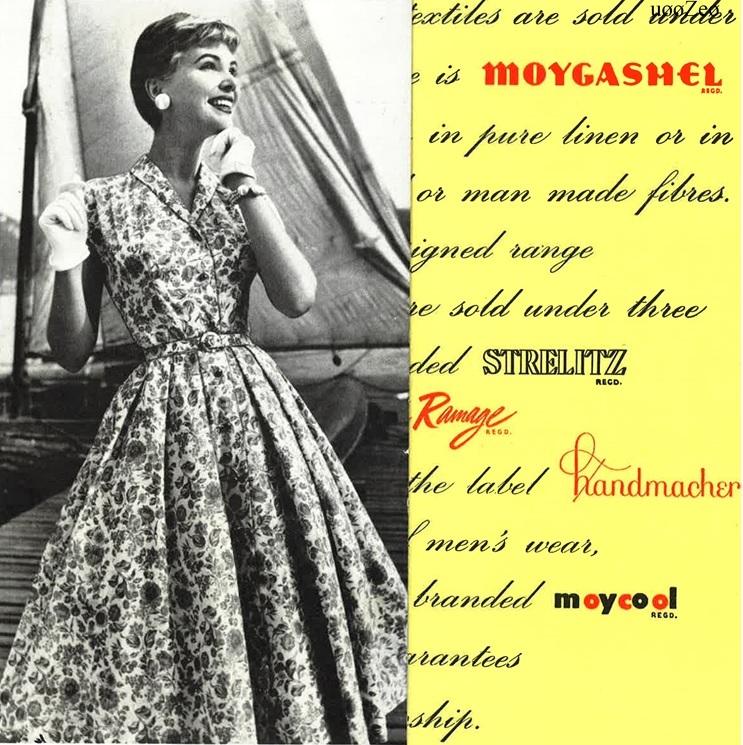 Among the fascinating publicity material is a souvenir booklet entitled Moygashel in Africa which was produced as a supplement to August 1949 edition of The Buyer, containing advertising and merchandising information for shops selling Moygashel dresses and fabrics under the Strelitz company name across the world. 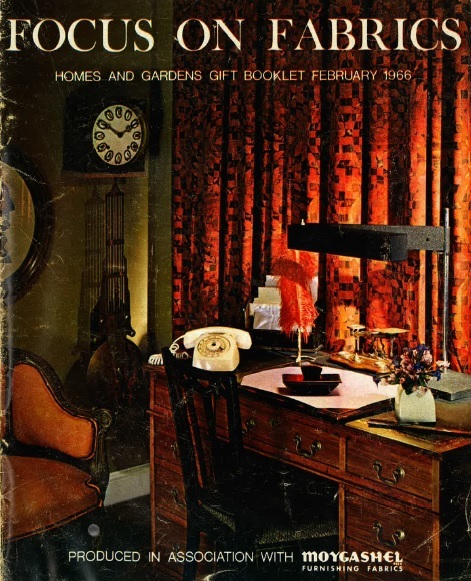 Similarly, a Homes and Gardens gift booklet from 1966, Focus on Fabrics illustrates the range of bold geometric Moygashel fabrics suitable for curtains and furniture coverings produced at the time. Moygashel fabric was never cheap and was packaged and presented in a way that reflects its elite status within the textile world. It was a luxury fabric, sold to high-end designers such as Christian Dior and Madame Schiaparelli, and for readymade dresses in leading department stores across the globe. As a result, the average Moygashel female mill worker could rarely afford to dress in the material she helped to produce. However, during World War Two Moygashel produced fabrics for use in affordable Utility clothing, particularly for Marks & Spencer’s range of Utility or Controlled Commodity clothing range in 1941 and for this short time period, their fabric was at least accessible to the general public. The archive provides a valuable insight into the social history of clothing during the mid-20th century, raising notions of affordability and status of clothing, and questions about how people bought and made their own clothing and home furnishings in the past. It also makes me wonder how the people who worked at Moygashel felt about working there. What are their memories of their time at the factory? Do they feel that they have made a contribution to Irish textile and fashion history through their work? It suggests that a more detailed investigation into the factory’s history via this archive is required as such documents are invaluable prompts for uncovering older peoples’ memories of either working in the factory or using the fine quality fabrics produced there. Such memories need to be recorded now as a resource for future research, display and education before the last generation to work in Moygashel Mills have disappeared. I am certain that people in Moygashel would be fascinated to know more about the history of their own village and the important role it played in Irish textile history, its contribution to how the image of Ireland was fostered and traded upon around the world, and how highly regarded the fabric still is to historians and collectors worldwide. In 2017, myself and artist Jacqueline Wylie hope to record oral and written testimonies of past workers at Moygashel Mills, as the basis of further research and a series of exhibitions on the history of the factory, so watch this space for further information! N.B. I would like to thank artist and PhD Candidate at Ulster University, Jacqueline Wylie, her mother, Mona Wylie, and extended family for help in writing this article and providing Moygashel archive material. REFERENCES : (1) Mona Wylie, ‘Moygashel Mills: A Brief History’, in Dúiche Néill, the Journal of The O Neill Country Historical Society, vol.16, 2007. (2) Anon, Moygashel in Africa, 1949. (3) Pysche Pirie, Focus on Fabrics, 1966. Rachel Sayers, Costume Society Ambassador, 2016. 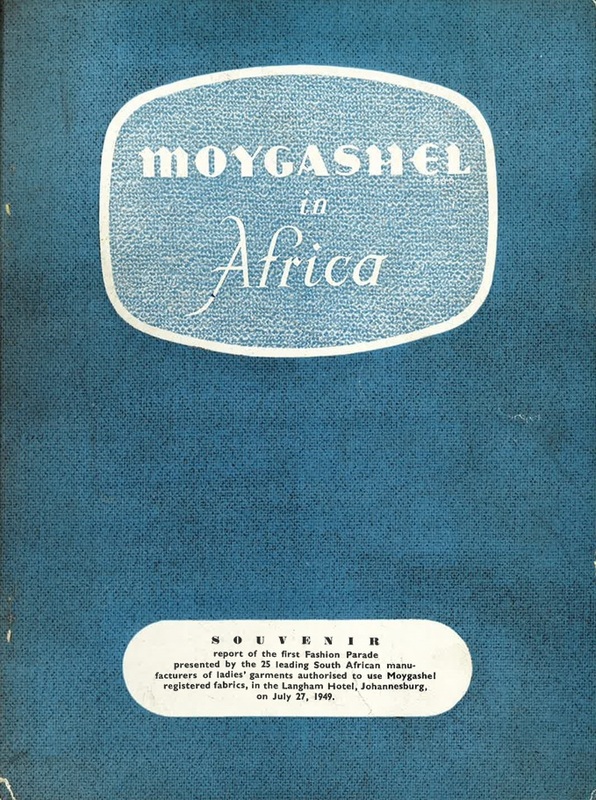 Moygashel Africa Sales & Fashion Shows Booklet, 1949. © Mona & Jacqueline Wylie. 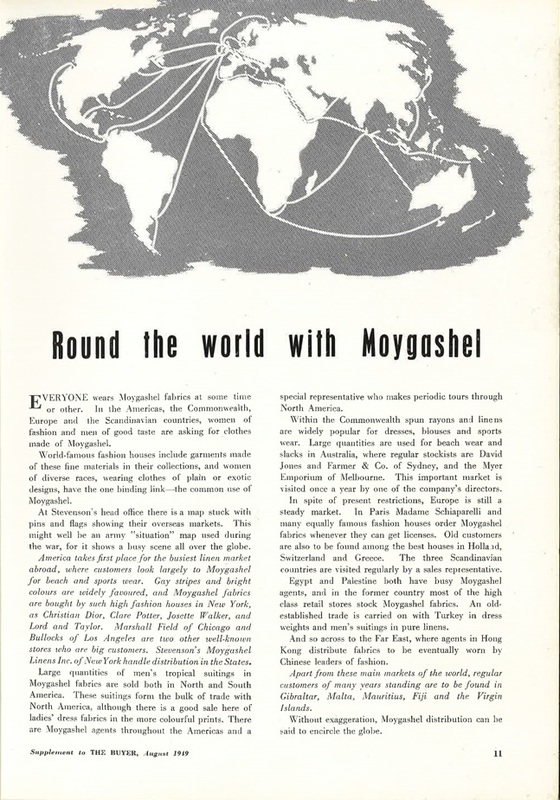 Moygashel Across the World, 1949. © Mona & Jacqueline Wylie. Moygashel Fashions, 1950s. © Mona & Jacqueline Wylie. 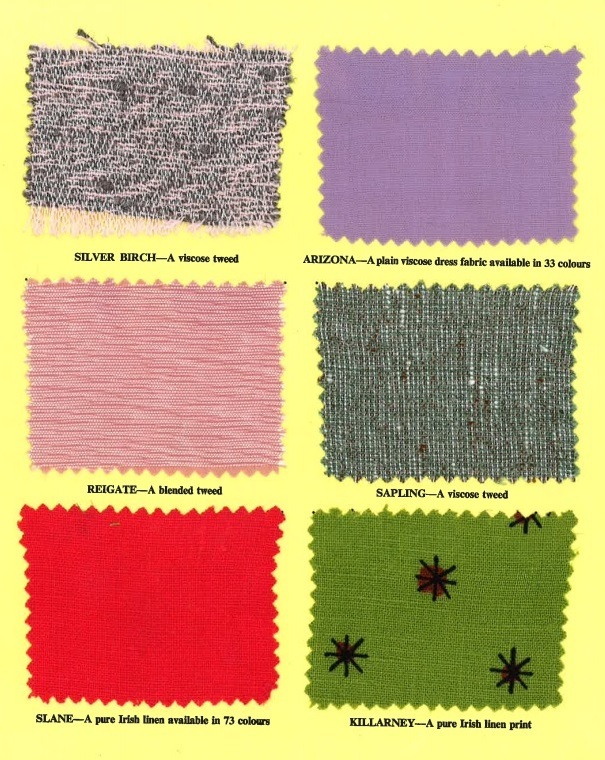 Dumony Fabric Samples, 1950s. © Mona & Jacqueline Wylie. Focus on Fabrics, 1966. © Mona & Jacqueline Wylie.